Your Connection To The Best Experience In Real Estate! In today’s real estate market, there is simply no substitute for an experienced and knowledgeable Realtor. When buying or selling your property, Donna Cheek strives to make it a smooth transaction and a pleasant experience. As an experienced top producing realtor of the London, KY area, Donna will provide you with detailed quality information that will help you make the best possible real estate decisions. She is a Certified Negotiation Specialist that will prove valuable when you are buying or selling. She knows the London, Corbin KY area very well and has developed her niche for lake front properties. She also works surrounding areas East Bernstadt, Keavy, Lily, Pittsburg and Gray. Donna Cheek made the move over to CENTURY 21 Advantage in London KY​ in 2014​ to obtain a new level of success for her and her clients.​ ​She Obtained the Emerald Award in her first year 2014 with Century 21​. Donna has reached a New Level in 2015 obtaining the Prestigious Centurion Award. 2015 Proved to be a Great Year with Donna S​ales​ Reaching Nearly 10 Million! She is an Extreme Marketing Specialist and is on Multiple Websites including her 2 personal sites, www.DonnaCheek.com and www.KentuckyWaterfrontProperties.com. Donna says that with over 92% of home buyers starting their searches on the internet. You need to be accessible, have a wealth of information, and be convenient to the public. 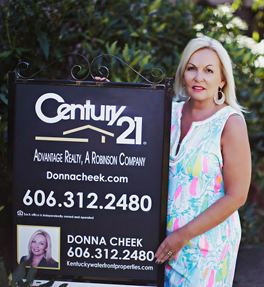 Donna Cheek started her real estate career in 2002. She has been a leader of sales and property listings in the London area for 2005, 06, 07 ranking in the top 7% in the Nation with coldwell Banker where she has won numerous achievement awards​ ​including the Diamond Award. In 2008 she joined RE/MAX where she excelled in sales being Top Producer 2010 & 2011, 2012 & 2013 and continued to be a multi-million dollar producer. Winning multiple awards including Executive & 100% Club.